How did you first get involved with sailing? My first encounter with sailing was at the age of 5, when my brothers started sailing. I was in swimming back then, but I still remember that I wanted to quit and follow my brothers into sailing. They wouldn’t accept me though since I was very young, so I had to wait a whole year to start. What was your first boat? It was love at first sight! They trusted me to be alone in my own boat, the Optimist. 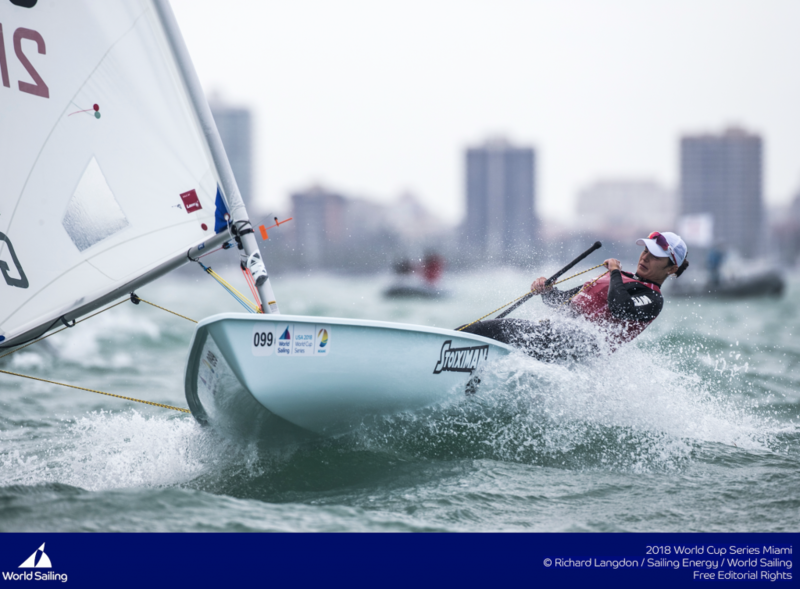 Why did you first decide to sail the Laser Radial? And what has kept you sailing it since? When I turned 12, I was getting too tall for the Optimist so I decided to transfer into the Laser. I was impressed at that age by the aerodynamic shape and by the fact that I didn’t have to share it with anyone! The sense of freedom, the fact that you are in touch with one of the most “alive” elements, the sea, and the fact that you are being cured from all your stress, worries, and coming out a brand new person from the water. What was the first international Laser regatta in which you competed? My first international regatta in the Laser was at age 13 in Hourtin, France at the Europeans, where I came first in the 4.7 (under-16). What did you take away from that first experience? Excitement, accomplishment, and a feeling of personal achievement. 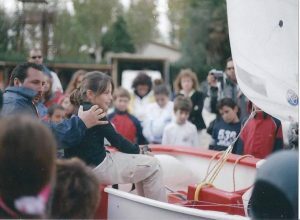 I was so happy since I was one of the youngest sailors. When you were getting involved in sailing the Laser Radial, were there any specific sailors you looked up to or strived to be like some day? One of my “heroes” back then was Anna Tunnicliffe, I remember being impressed by her fitness and persistence. Do you think you’ve achieved those early goals or are you still working on them? I promised myself that I would go all the way, and I honestly can say that sailing has given me the greatest feeling of self achievement. 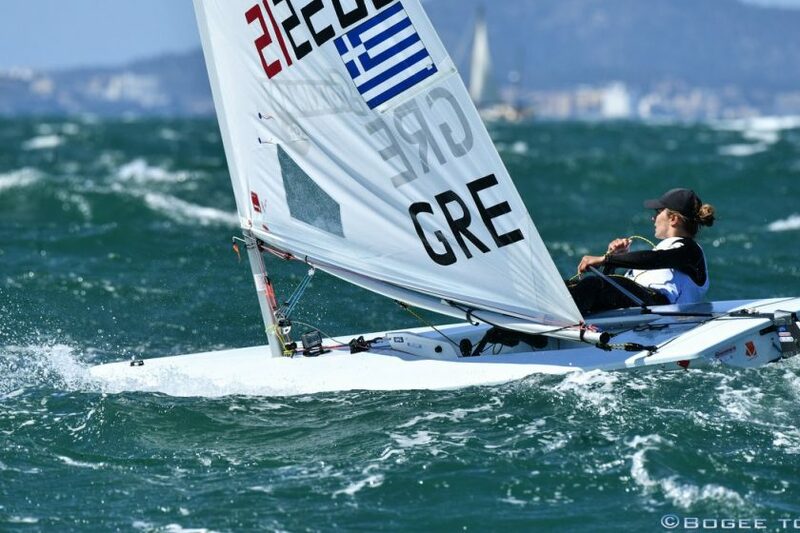 Do you train with any other Greek Laser sailors that are in the same circuit? Before I left Greece for Gran Canaria I used to train with mostly Greek sailors and mainly boys, sometimes even with the Laser Standard sailors in order to increase the difficulty level of my training. How long have you been involved with Sailing Academy Gran Canaria? 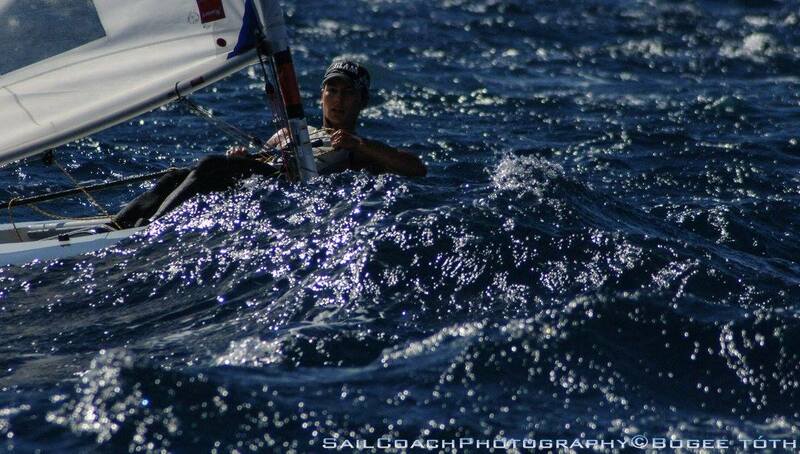 It’s been 2 years now that I have been working with my coach and the Sailing Academy Gran Canaria. Why did you begin training with them? How have you developed as a sailor since you started? It all started when Tommy invited me to work with him, since he had seen me racing in international regattas. I believe that the Academy provided me with a full preparation program and the knowledge of how to achieve full potential. Tommy improved my technical sailing and really believed in me since day one. 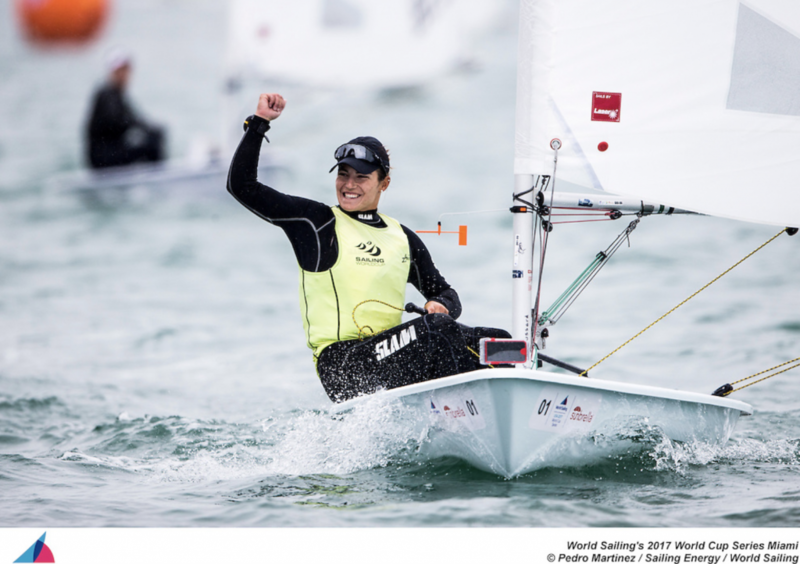 In January last year, you won gold at Sailing World Cup Miami. Was that your first international win and podium? Well, before Miami’s gold medal I had some wins in the Youth level, like in Croatia’s Youth Championship in 2013 where I won third place, in Kiel in 2016 I won second place in the Under-21 World Championship and finally in Croatia, again third place in the Europeans (Under-21). Shortly after, you placed second at the 2017 Sailing World Cup Final in Santander. 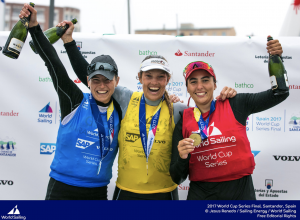 As one of the younger sailors in the women’s Laser Radial fleet, what is it like competing against some of the best and more experienced female sailors in the world? Racing against the best female sailors is quite rewarding and an amazing experience since from every regatta you gain a different insight for your sailing. It’s a constant learning process. 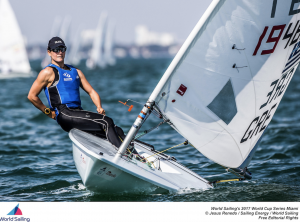 Although 2017 was going well for you, you had a more difficult time at the Laser Radial World Championships in Medemblik, finishing 27th. What about that regatta was tough for you? Well, I generally can “feel” the weather, but in Medemblik I had a really hard time reading the weather patterns. It gave me the impression of a psychopath personality….I still have no clue what was happening. Finishing top-10 at the Princess Sofia Trophy last month, it looks like 2018 is off to a good start for you. What are your goals for 2018, with Aarhus Sailing World Championships approaching? My main goal for 2018 is to get the qualification for my country in Aarhus, everything else comes in second. What are your strengths that you plan to enhance and what areas do you need to improve to qualify for Tokyo 2020? I have to improve in minimizing mistakes into my sailing since I sail instinctively a lot, so I have to stick on the basic principles of tactical sailing. While there is some element of luck or circumstance involved in sailing, it is often about minimizing mistakes at this level. How do you work at reducing mistakes, or minimizing their impact? The only way to minimize the impact of your mistakes is through…speed. Do you have any particular “rituals” or routines that you do before going out on the water to compete? Yes, I do have a certain routine before going onto the water, and I admit that I am prejudiced about certain things. I believe that all athletes are in one way or the other. Do you think you are likely a role model for younger sailors just starting, specifically competing for Greece? Do you interact with any young sailors on a regular basis? Yes, I believe that whether we like it or not, younger sailors look up to successful sailors, exactly like I used to do, and like I am still doing with more experienced sailors. Whenever I have the luxury of slack time, I like to interact with younger sailors, trying to help them out and answer possible questions, as long as I know them. Do you attend University? What are you studying? I attend the Athens University following Pedagogical Studies, since I love kids a lot. Do you plan to pursue those studies later at some point in life? I don’t know if I will pursue my studies later on, I am also following classes for a sailing coach license provided by Sailing Academy and I must say that I am really interested about that. What do you enjoy doing when you need a break from sailing? In my spare time I really enjoy to get into traveling adventures and I love to meet people and try to understand their mentality. I am also good at drawing, my brother is in the School of Arts in Greece and I believe that if I was not so much into sailing I would probably be an artist! I suppose it is hereditary. Do you have any hobbies outside of sailing that help you better yourself as a sailor? I also love to dance, and I strongly believe that a good dancer is also a good sailor, maybe it has to do with the sense of balance and the smooth moves. What would you like readers to know about Vasileia Karachaliou as a person? Well, if anyone has to know something about me, it is that I am a pretty forward person. I hate side ways of speaking or expressing myself, and I believe that the straight line is the shortest and fastest route of all!